This past February 27th, in Priego we had a get-together with the girls from the catechism class preparing for their First Communion. The activities began at 11am. Although high winds had been predicted that day, the girls and their mothers were very brave and came to our house anyways. 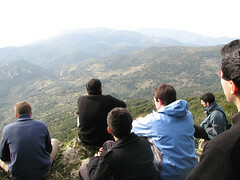 On Sunday, February 28th, we had a retreat for young women. On Friday, there were only two girls signed up and we had decided to cancel it. But then, it became obvious that Our Blessed Mother wanted this retreat to happen...because on Saturday, we suddenly found out that several girls who we thought would not be able to make it, were coming. In the end, there were 15 girls all together. On Saturday, February 20th, Fr. 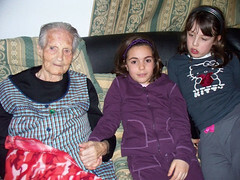 Rafael and the Servant Sisters had the first get-together of the Home of the Mother in Valencia, Spain. There, waiting for us, were the lay members of the Home in Valencia and from other parts of Spain, to begin the Home in Valencia. Two consecrated lay women from the ACIM (Apostles of the Hearts of Jesus and Mary) in Spain, Helena and Marta, have been here with us since February 2nd. 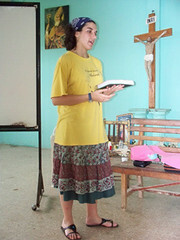 Helena is a doctor and has come to do an internship for practicing rural medicine. This past Sunday, February 21st, several families and Servant Brothers of the Home of the Mother came together for a Mass celebrated by Fr. 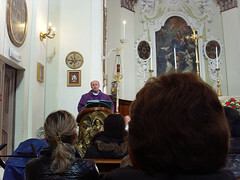 Felix Lopez, SHM, in the parish church in the town of Monte Reinaldo (Ascoli Piceno, Italy). 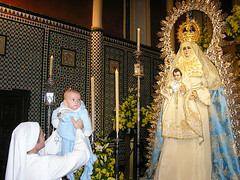 This past Sunday, February 7th, 5 days after the Feast of Candlemas, from 4:30-7pm, nearly 350 babies born and baptized in 2009 were presented at the Shrine of “Nuestra Señora del Águila” (Our Lady of the Eagle) in Alcalá de Guadaíra, Seville. 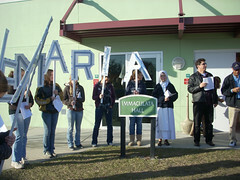 On Friday, February 12th, the Sisters and girls from Jacksonville went to Tampa for a get-together for girls and lay members of the Home of the Mother. We stayed at the Rectory of St. Anthony's Parish, where we also met up with some of the girls from Tampa. We can finally announce that the Home of the Mother of the Youth has begun in Italy. 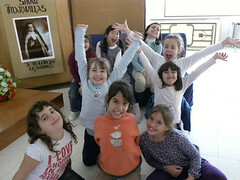 On Saturday, February 6th, First Saturday of the month, a group of 6 girls entered the Home, the first members of HMY in Italy. We, the Servant Brothers in Rome, are in awe! It is so great to be able to study in the Heart of the Church! Every day, we are able to see that the Church encompasses every continent, as many of our companions at the university are from all over the world. Also, we are able to listen to the Pope. He has given all of us, the entire Church a Year in which to meditate on a beautiful vocation: “How great is the priest. If he realized this, he would die. God obeys him: he utters a few words and the Lord descends from heaven at his voice, to be contained within a small host.” (Benedict XVI, quoting the Cure of Ars) Such a close intimacy with God requires that the priest renounce any kind of protagonism, and to the degree in which we decrease, Jesus can shine forth. This is what we are called to live! On Sunday, February 7th, Fr. 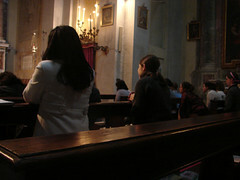 Rafael, along with Servant Sisters, Servant Priests/Brothers, members and friends of the Home of the Mother, all came together at "San Maurizio" Parish, located on the outskirts of Rome, for the baptism of Baby Pablo de Maria Tridente, son of Laura and Giovanni Tridente (members of the Home) and now a child of God. This past Saturday, February 6th, in La Aldehuela (Getafe), we had this year's first get-together for grade-school age girls. There was time for everything except being bored. The youngest girls helped Jennifer find virtues, thanks to a secret map. They made a beautiful jewelry box and they did a "show" in the afternoon. 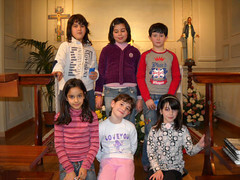 We had a skating contest, games and dancing, and to top it all off, a Holy Hour to console Jesus in the Eucharist. HM Television, together with the Holy See’s Congregation for the Clergy, presents “Alter Christus”, a fast-paced film on the many aspects of the priesthood in the life of the Church. Centered on the life of St. John Vianney, the topics covered range from the Priestly Identity to the Sacraments, from Celibacy to the Mission. The video is included in 5 languages: English, Spanish, French, Italian, and German. We are truly in awe as we witness the amazing apostolic dimensions of mass media. It has been almost a year since HM Television produced the program “Life Will Triumph” (first issued in Spanish, with the title “La Vida Vencera”), with the goal of responding to the aggressive political maneuvers taking place in Spain, as in other parts of the world, in efforts to legalize abortion. The program was distributed to nearly 1,000 associations or organizations active in defense of the unborn and it was also aired on several national and foreign television channels. HM Magazine – Thank You! At the beginning of 2010, the Home of the Mother Magazine that began being published a little over 25 years ago by a group of enthusiastic young people with very little resources, had to launch an urgent appeal to all its subscribers. We now have information available on this year's Holy Week Encounters. This year, as in the past, there will be Encounters in Ecuador, Florida (USA), and Spain. For the first time, there will be one held in Canada.